It’s opening day, folks, a good day for getting a good glass of bourbon or a fine mixed bourbon drink, and watching your favorite baseball team start a fresh new season! The Detroit Tigers are lucky enough to start their season in Miami this year, staving off the unseasonable 20 degree cold we are enjoying here, at least for a few more days. Go get em Tigers, and happy Opening Day! 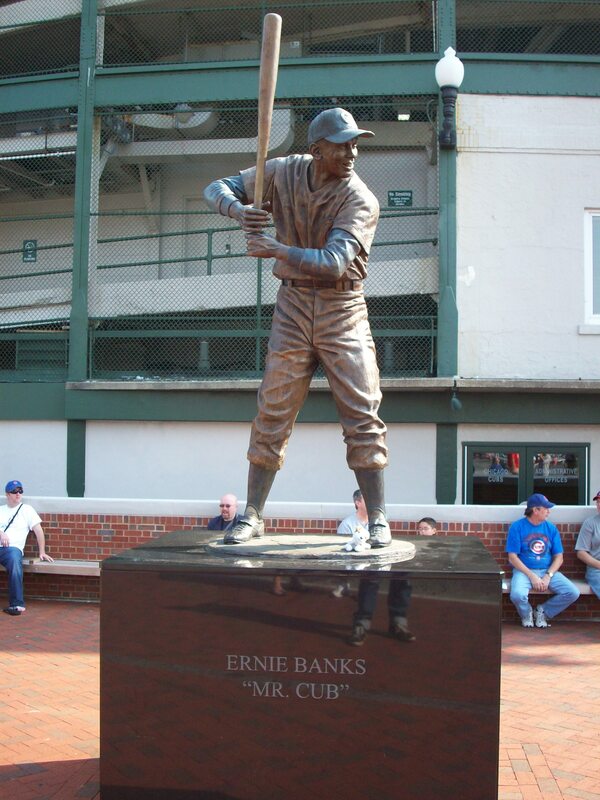 I, along with so many others, was saddened this weekend to learn about the passing of Ernie Banks. Banks, “Mr. Cub,” passed away on Friday at the age of 83. Growing up, I loved the stories of Banks and his absolute love of the game. He was undoubtedly one of the greatest of all times, and as so many have said, he will be missed. It’s a great day for baseball. My write up of a trip to Wrigley Field here. In September of 2012, I married the beautiful and talented Jen Weaver here in suburban Detroit, Michigan, in a ceremony that we had spent over a year putting together. It went off beautifully, and our months of DIY work was complete with both of us satisfied with how well it had gone. The day after the wedding, we embarked on our honeymoon: a trip up the California coast. Our trip was to begin in San Diego, with a couple days there, before moving up the PCH to Santa Monica, Big Sur, Monterrey and finally, San Francisco. We planned all kinds of events for our week – parks, historical sites, shopping. And for that Friday, we decided we would take in a San Francisco Giants ballgame at AT&T Park. The trip started off bumpy, with my wife getting food poisoning from the destination airport food. But she shook it off well and, with a convertible Mustang, the first couple days were awesome. Then, swimming in the ocean at 6:00 in the morning in Santa Monica, she broke my foot. Not intentionally, of course, but her kicking out into the waves one way met my kicking towards the beach, and my foot looked like it had been hit with a hammer. Refusing to go to the hospital on our honeymoon, I pressed on, pain-be-damned. That night, at a resort in Big Sur, I waited until she left the room and pressed hard on the swollen foot and felt the bone snap into place. I assumed that meant it had just been dislocated, and we journeyed on. It wasn’t dislocated, of course. We didn’t know until I saw the doctor when I got home, but the foot had actually been broken in two different places. My doctor said that setting my own broken bone was one of the toughest things he had seen…and one of the dumbest. I got lucky and it went back together, but it could have gone horribly awry. I tell this tale only to lay the pretext for our trip to the ballpark. By the time we got to San Fran, my foot was swollen and I could barely walk. Luckily, our hotel was a short half-mile or so from the ballpark, but hobbling along on one leg, it felt like one hundred. The game was against the San Diego Padres, and as we got closer and closer, the streets and sidewalks filling up with fans, I have never been happier to arrive at a park. From the outside, the brick facade of AT&T park is reminiscent of Camden Yards. There are the usual statues of Giants greats outside, and plaques on the walls. Being a Friday night in a year where the Giants had already clinched a playoff spot, the crowd was enthusiastic and exuberant. When picking our seats, I had researched online to find the section and area that would give us the best view, not only of the game, but of the beauty of San Francisco. Section 304 looked like a winner, with a dramatic vista of San Francisco Bay, the Bay Area bridge and overlooking McCovey Cove (where kayakers and boaters camp out to hit a home run clearing the wall in right and landing there in the bay). We headed up to our seats, stopping to take a look around the stadium as we went. The sightlines of the field in the lower concourse were quite nice – one of the best things about newer parks is the ability to keep an eye on the game while getting concessions. We had been informed to be sure and get Gilroy Garlic Fries, so that was stop number one, along with some dogs. We were astounded by the concession selections. SanFran is known as a foodie paradise, but the fact it extends to their ballpark is truly awesome. There was seafood, veggie and vegan options, traditional ballpark food – even wine offerings that helped to remind that Napa was just a short drive away. We made our way up to our seats, and were truly impressed by the view. Oakland over the distance, the field spread out beautiful in front of us. It was absolutely breathtaking. The seats around us began to fill, and we were even more surprised to note that everyone around us were season ticket holders, and knew each other! In fact, it wasn’t until the 3rd inning that we found out one middle aged couple next to us had been divorced for a decade, but still shared a love of the Giants – and their seats. As the sun set and the game started, the famous San Francisco chill began to move in. As my new wife began to shiver, those around us (who by this point had inquired and then congratulated us on our nuptials) shared their blankets with her. We talked baseball, the Giants, marriage, Detroit, more baseball, Buster Posey, Barry Bonds, Los Angeles, beer and baseball for nine innings with these awesome fans. I am always proud of how knowledgeable my hometown (Detroit) and adopted hometown (St. Louis) are about baseball, but I found these Giants boosters to be as smart as any of them. When we finally got up to leave, they wished us well as we walked along the right field fence and looked out into the chilling waters in the cove (a baseball had actually been hit in, by Chase Headley scoring the Padres only run). Poetically, we stopped in the gift shop to purchase stuffed animals. My wife and I both have nicknames for each other, and it just so happened that the Giants did too. Like Pablo Sandoval, I’m the panda. Like Brandon Belt, my wife is the giraffe. I thought of that trip and the wonderful fans this year when the Giants won their third title in five years. What a lovely park. What a lovely time. Below are my stats. I’ll post them for every park I’ve visited. I include the big details, as well as who I visited with. Lastly, I am a huge fan of throwback jerseys, and for every stadium I visit, I buy one of a player from that organization I admired as a kid, from watching them or reading about them. So for every one, I will also list the throwbacks I’ve purchased for each. Well, first of all, Happy Halloween! Once more it’s the time of year with ghosts and goblins, tricks and treats. Children dressing scarily and wondering through your streets collecting candy. I hope you and yours enjoy it this year. It’s also deep into autumn, with the harvest coming up, and I like to think of all the corn, the wheat, the ryes that will soon be mashed and distilled into my favorite treat – whiskey! Secondly, congratulations to the San Francisco Giants, who last night won their third World Series in five years. I feel like the Giants are our adoptive team, as my wife Jen and I went to see them during our honeymoon in 2012. Particularly amazing was the performance of Madison Bumgarner, I’m glad I watched this series through to the end! And now…on to bourbon. Or in this case, rye. The Willett name has a long and storied history, going all the way back to pilgrims who arrived in the US in the 1600s. The Willett family has been responsible for bourbon distilling in Kentucky since the 1860s, and has played an important role in much of the great bourbon legacy there. In the 1930s, the Willett family started the Willett Distilling Company on the family farm in Bardstown, Kentucky, and it still sits there today. Willett, which later changed it’s name to Kentucky Bourbon Distillers(1984), made bourbons on the family farm up until the 1970s. At that time, during the oil crisis, they made the decisions to have their whiskey brands made elsewhere and age and bottle them (or just bottle them) onsite. This allowed them to convert their production facilities to make gasahol fuel. This venture did not work out, however, and by the 1980s, the Willett location was only used for it’s warehouses and bottling. Several brands are released under the Kentucky Bourbon Distillers name – Johnny Drum, Kentucky Vintage, Rowan’s Creek, Noah’s Mill among others. They also do aging and bottling for a few other brands, including Corner Creek and the sought after Black Maple Hill. In the mid 2000’s, the family started work to reopen the Willett production facilities, and by 2012, they barreled the first of their new products. And in 2014, they unveiled it at last – the Willett Family 2 Year Rye. I was down in Kentucky in June and visited Willett, and was lucky enough to land a few bottles of the brand new, Willett produced two year rye. So how’d it taste? 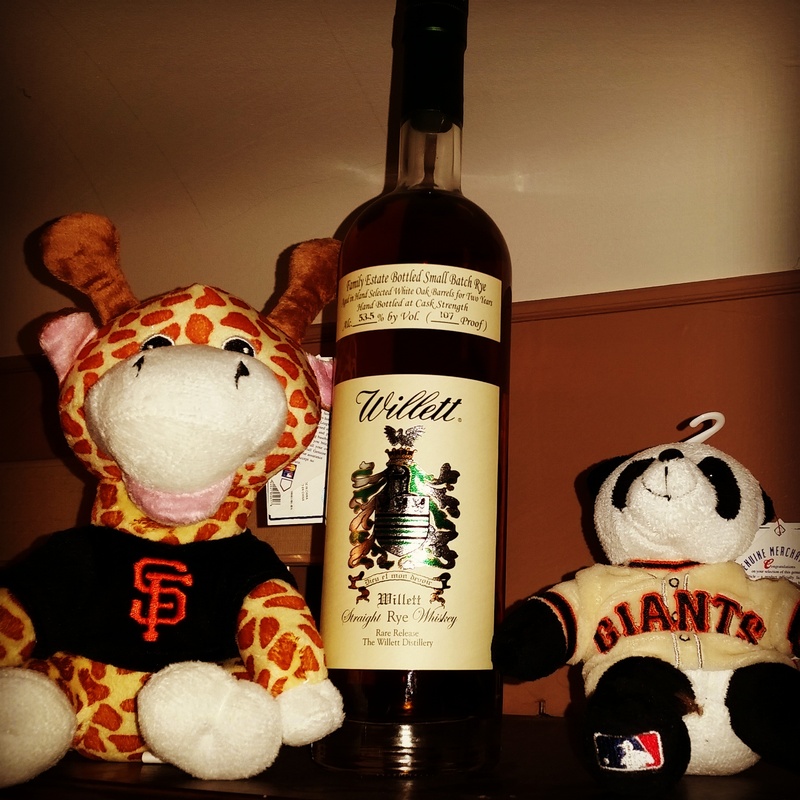 107 proof – that was the strength of my Willett 2 Year Rye – a nice barrel proof number. And Willett certainly knows bottling – their Still Pot Reserve has won awards for it’s beautiful bottles, and their ryes come in beautiful bottles adorned with the family seal as well. In short, it’s a lovely bottle. It has a nice gold color, and the nose is fantastic. There is a definite fruitiness in the nose – I picked up cherry, citrus and a hint of raisin. The woodiness reminded me of something other than oak – more like a cedar or even a Christmas pine. I soaked it in, and found some vanilla. What shocked me the most was the lack of a burn. Despite the high proof, this pour didn’t smell like pure alcohol, and had a surprising richness. I’ll admit, my first sip was jarring. The nose had put me to sleep, and I took perhaps too big of a drink, forgetting the high potency of the proof. But even as I coughed a bit, caught off guard, I noticed how smooth it was going down. My next drink was more restrained, and I got a good feel for this rye. It was softer than a 2 year has any right to be, with a great range of flavor that belies it’s age. It had an earthiness to it, and I thought mint rose to the top, along with a maple. I didn’t note the usual pepper or cinnamon ryes have – it’s probably too young to have really soaked that in from the wood – but there is far more citrus than I would have ever expected. Overall, it’s rather sweet. And it has a nice finish to boot. Not the longest finish, but smooth and lingering where a touch of spice mixes with an earthiness (that is probably the biggest tip off to it’s age). On the whole, I’m not as big a fan of ryes as I am traditional bourbons. But for this Willett entry, I’ll make an exception. It doesn’t have the ‘graininess’ of a young rye – that taste that lets you know that some of this whiskey has never touched the side of a barrel. Instead, I would have thought upon blind taste that it was at least four, and maybe even six or eight years old. What really intrigues me is what these barrels will taste like in a few more years! Look, let’s get the obvious out of the way: you are probably saying “hey Dan, funny we haven’t seen you post in two weeks, since you declared your Detroit Tigers favorites to win the American League!” Yes, that’s true. You might say, “That timing seems a bit suspicious, like you decided to lay low and avoid the mockery and derision that would come your way!” Yes, point taken. You might say, “Hey Dan…” but at this point, I would punch you. It’s true, we lost. To a Baltimore Orioles team that beat our bullpen like rented mules and made our hitters look like children swinging wiffle bats. It was upsetting, but I’m over it. Watching that same Orioles team get out-ran, out-fielded and out-hit by this never say die Kansas City Royals team was truly something to see. 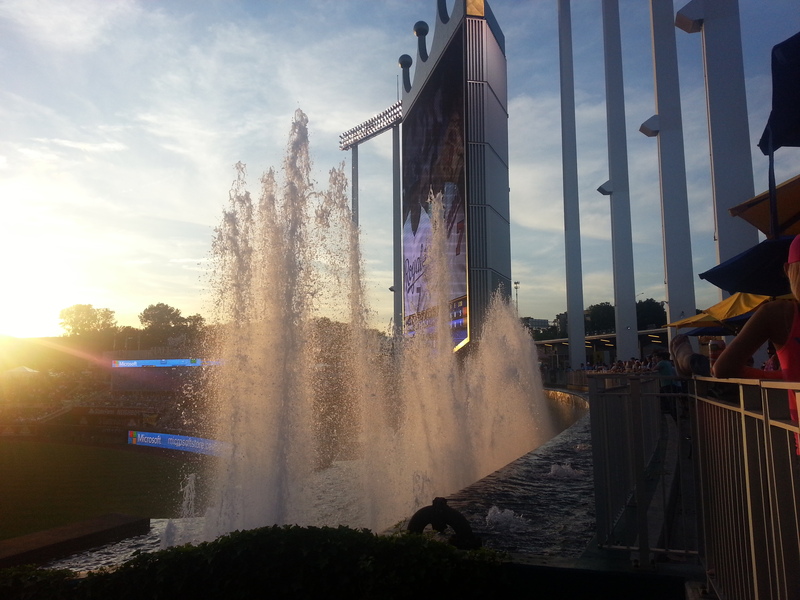 So this week, I look to 2013, when I was lucky enough to visit the lovely stadium and fountains of Kaufmann Stadium. It was the best kind of event one could hope for – we were headed into Kansas City for the wedding of my wife’s friend Mike, and the Royals were on a home stand. I had gone to the University of Missouri and have friends in the St. Louis area, so an agenda took hold – we would fly from Detroit to St. Louis, visit some friends, then rent a car to drive from St. Louis to Kansas City (stopping in Columbia for old times sake) before enjoying a weekend of wedding fun, BBQ food and a Royals game. The plan worked flawlessly. My friends were wonderful, the weather was perfect and the drive – roughly four hours straight – was great too. We stopped in Columbia and I showed my wife my old dorm, the famous Mizzou columns, even stopped for a bite at Shakespeare’s Pizza. We arrived in Kansas City, checked into our lovely hotel downtown, and got ready for the game. The first thing an out of towner might notice when driving to visit Kaufmann Stadium – or it’s next door neighbor Arrowhead Stadium – is that they are seemingly in the middle of nowhere. Right off of I-70, both stadiums are set in the middle of a massive expanse of parking spaces, with little else to see. As we pulled in, it was a bit disorienting – nothing but concrete as far as the eye could see. Now while this may kill the distinct Kansas City flavor from the environs, it allowed for something else: tailgating, and lots of it! I’m not used to seeing people tailgate before a baseball game, much less a June game between two teams headed for the basement, but there were people with grills and food going everywhere. Furthermore, it was “Girls Night Out,” a promotion geared towards female baseball fans, and they were out en masse. 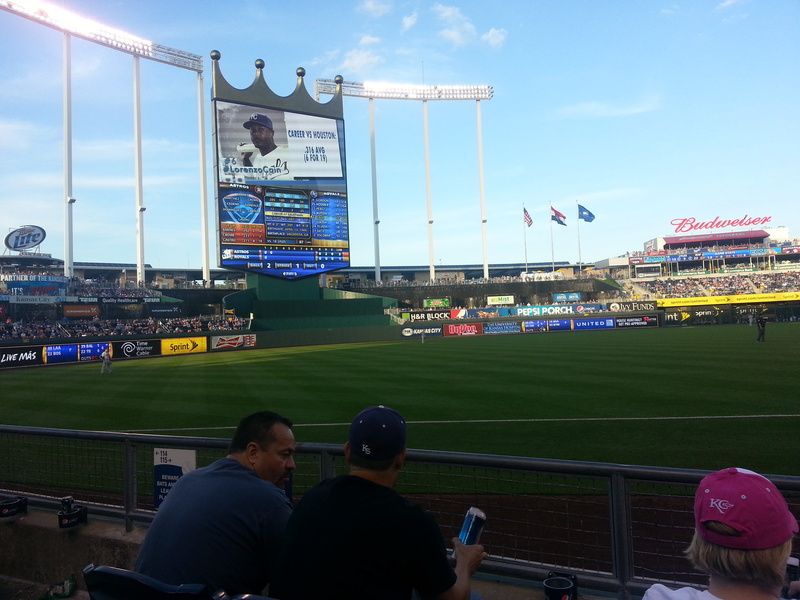 Pink Royals jerseys, pink hats and high pitched cheers abounded. I bought my tickets through StubHub (I like to see if I can get better seats from a season ticket holder looking to unload them than from the team site and, whoopee, it worked! ), so I picked them up from Will Call, where the Royals employees were wonderfully nice. Tailgating, Ladies Night, Friday or not, there was no way this game was selling out. Our seats were fantastic. The third base line, a few rows back. We had a perfect view of the entire ballpark. The famous Royal crest in the outfield with it’s massive scoreboard. The fountains around the outfield, erupting at intervals. This stadium, despite it’s early 70s birthday, really is a relaxing, comfortable place to watch baseball. As the night went on, we watched a low scoring affair. We wandered the park, and were impressed with the sight-lines one can get from almost anywhere within. Particualrly cool was standing in the outfield by the fountains, watching them go off from close and looking over the lush outfild grass. 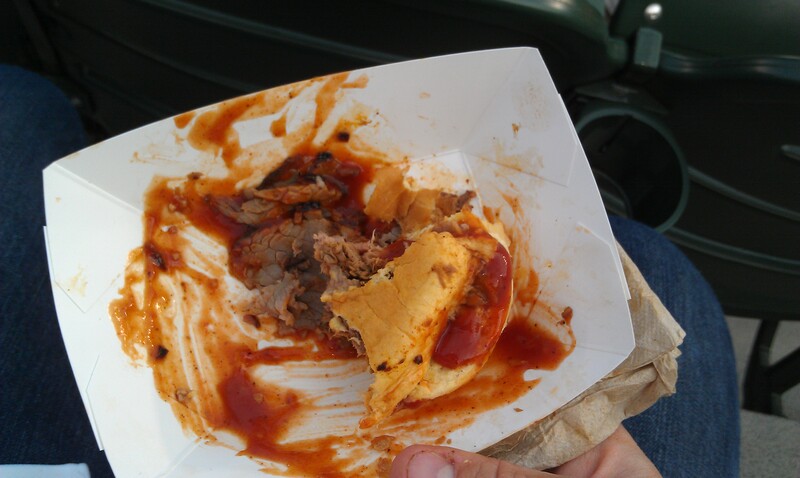 We tried a few different BBQ concessions, but none had quite the taste of real Kansas City BBQ. The real surprise of the night came in the 7th inning, when the concessionaires announced it was “dollar” time, and all hot dogs, soda cans (Pepsi products) and peanuts/popcorn was now, yes, $1. I have to humbly report that I may have scarfed down four hot dogs and three sodas at this point, because I’m a midwesterner who can’t refuse a value. I’m willing to bet that, with their team in the Series now, $1 hot dogs are harder to find at Kaufmann than a Royals fan who didn’t jump on the bandwagon in August. I’m just kidding. Well, sorta. Because that was the only downside to my visit. The park is absolutely beautiful. I love the huge Royal crown, the 13 story scoreboard. The concessions were a value. The fountains are amazing. The post game fireworks on Friday were impressive. The game was even very good, with two small ball teams going at it. But the fans weren’t, at least not in large part. There was the enthusiasm that came with the ‘Girls Night Out’ promotion, but not a lot of cheering or booing going on. As an observer of the AL Central, I noted how, even this year, in the midst of a pennant chase the Royals weren’t selling out. There are great and knowledgeable fans in Kansas City, no doubt. But compared to their cross state brethren in Cardinal fandom, they have a long way to go. That said, Kaufmann was a beautiful park and I would go back in a heartbeat. Especially if it was to see the Tigers top them again. Tonight, the American League Central Division Champion Detroit Tigers start their fourth consecutive American League Divisional Series with a match-up against the AL East champion Baltimore Orioles. Since the Tigers are my hometown team, it’s not hard to figure out where my rooting interests lie. And while this season was grueling, with the Tigs not clinching the division until the season’s last day, we in Detroit are feeling pretty good about our chances. I will admit, however, that I regularly root for the Orioles in their division. Like the rest of the world not living in the five boroughs, I despise the Yankees. Once I had a sympathy for the Red Sox and their unbeatable curse, and cheered joyously as they won that memorable title in 2003. That dissipated quickly as Sox fans became unbearable in the years since, and I now only root for them when they play the Yankees. If Tampa Devil Ray fans don’t exist, why would I acknowledge their team? And the Blue Jays…well, I don’t really dislike them, but they have to make the playoffs for me to root for them. That makes the Orioles the lesser of five evils, I guess. Those days are over. Tigers in three! four! That said, I was able to visit Oriole Park at Camden Yards in 2012, My wife had a work conference in Washington DC in June, including a couple of evening events, so I used the opportunity to rent a car and drive north to catch a game. Particularly fortuitous for me, my wife’s uncle and cousins – Maryland natives – were happy to meet me at the game and make it a night at the ballpark! The drive in was less than ideal – while DC and Baltimore may be separated by few miles (40 or so), the drive time between the two is a bit on the slow side. I’m sure natives to the area are well aware of this – unfortunately, I was not. When I did arrive in Baltimore, however, I was pleased to find how easy it was to get to the park! There is ample parking, thanks to a nicely developed area of hotels and convention centers nearby, and was parked and ready to go in no time. Driving in from DC, I noticed the large crowd of people in Orioles gear between a statue of Brooks Robinson and a few bars names Pickles and Sliders across the street from the stadium. I wandered over for a bite and to catch some local flavor – and I did. In particular, I’ve developed a taste for ‘Baltimore Wings,’ which are the local take on traditional Buffalo Wings. Baked in butter and rubbed with Old Bay seasoning, they may be my favorite wings in the world now. 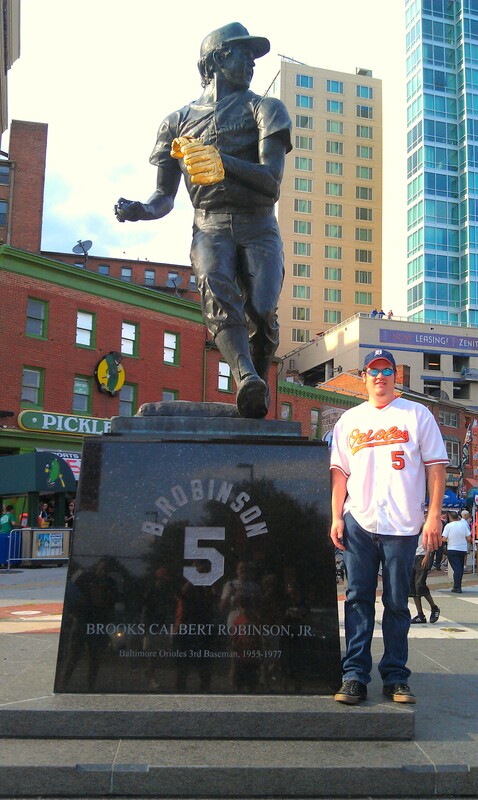 People hung out and talked baseball, but I snapped a pic in front of the Brooks Robinson statue, and headed over to the large main gates to get a feel for the place. Upon entering the park from Camden and Eutaw, the first thing you notice is how the stadium feels like an older park than it really is. This is, of course, by design. After years of demolishing our baseball cathedrals in favor of bland, round, all purpose stadiums (like Three Rivers or Veterans stadiums), Oriole Park at Camden Yards was a much heralded return to the classics. Set in an actual part of the city (as opposed to far-flung suburbs), built with brick and iron and as a part of it’s surroundings (the warehouse overlooking the park from center to right field). It revolutionized ballparks, and while it has borne many imitators (including Comerica Park here in Detroit), it is still very unique. Strolling along the bricks above the outfield, I had to stop into the famous Boog’s BBQ. Boog Powell, slugging hero of those late 60s and early 70s Oriole teams, has a BBQ stand/tent here, and it came highly recommended. An additional treat – Boog was there that day, and I got to shake his hand, get an autograph, and chat for a few minutes with a Baltimore legend! And the BBQ was delicious too. Our seats gave us a great view of the park – it really is a beautiful sight. I was there during an interleague matchup, and many fans from Pittsburgh were there as well, so there was a good spirited taunting going on in the stands. A high scoring game, we were able to see everything clearly, and despite it’s throwback style, Oriole Park has plenty of modern game-watching amenities: great scoreboards, clear public address, ball, strike and pitch speed sensors throughout. Steve Pearce and Mark Reynolds both hit shots our way, and we even thought we might have a chance at catching Reynolds. The O’s scored early and often, and the game was fun for the hometown fans. At one point, I headed up to the picnic tables in centerfield to grab some crab dip and waffle fries – a local favorite – and found out OPaCY is one of the few ballparks in which you can bring your own food and drink (provided the drinks are sealed)! A walk down Eutaw was particularly enjoyable, as you watch the game on the one side, and check out the bars and souvenir stands inside the warehouse on the other. Now, it did take me almost two and a half hours to get back to DC after the game, but that didn’t dampen my fun. Oriole Park at Camden Yards is a beautiful park, and another must see for baseball fans! …followed by last night. In his last game wearing Yankees Pinstripes, Jeets hits a walk off single to win the game for the Yankees. Surely Joltin’ Joe and The Kid smiled down from the heavens. I hate the Yankees, like most rational thinking baseball fans in this day and age not living in the greater New York Metropolitan area (or unabashedly front-runners, who are probably moving over to Mike Trout Angels jerseys as we speak). That doesn’t diminish, however, The Captain’s legacy. Derek Jeter was a constant, a great player, a sure-fire hall of famer, who exuded class even in an era when the Yankees payroll became as bloated as C.C. Sabathia at the Old Country Buffet. He’s one of the few stars of the Steroid Era to not be under suspicion – and that includes many of his pinstriped teammates (we see ya’ A-Rod, Giambi, Rocket and Petite). He was a great player. Now with that said, I would invite those heaping attention to take a second and look at the career statistics of one Alan Trammell, who also played a 20 year career in one place. Detroit may not be the Big Apple, but Trammell was part of a record setting double play combo, and the glue that held the Tigers together for 20 years. He wasn’t quite as good offensively as Jeter, but was better defensively, and with a comparable WAR and advanced sabermetrics, maybe some light could be shed on his career before it’s too late for him to be enshrined in Cooperstown. Down the hall from Jeets – two great shortstops who were leaders on the field.